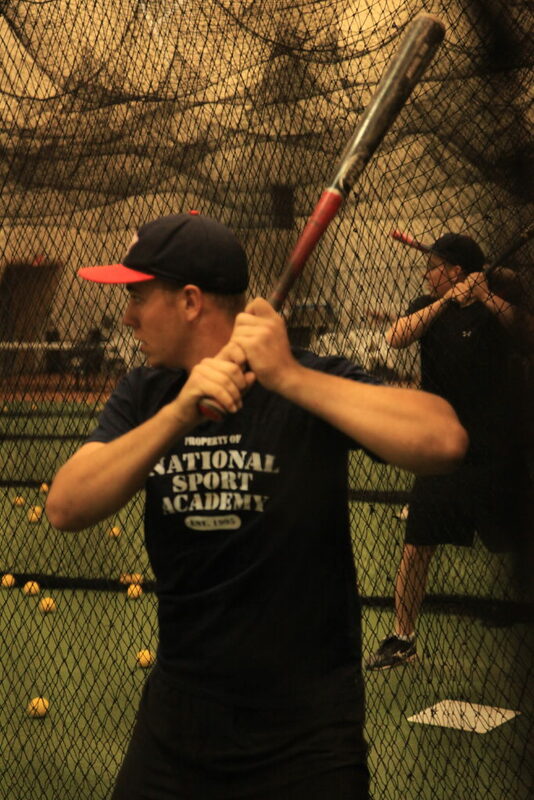 National Sport Academy Baseball indoor training – purposeful practice to increase repetitions. 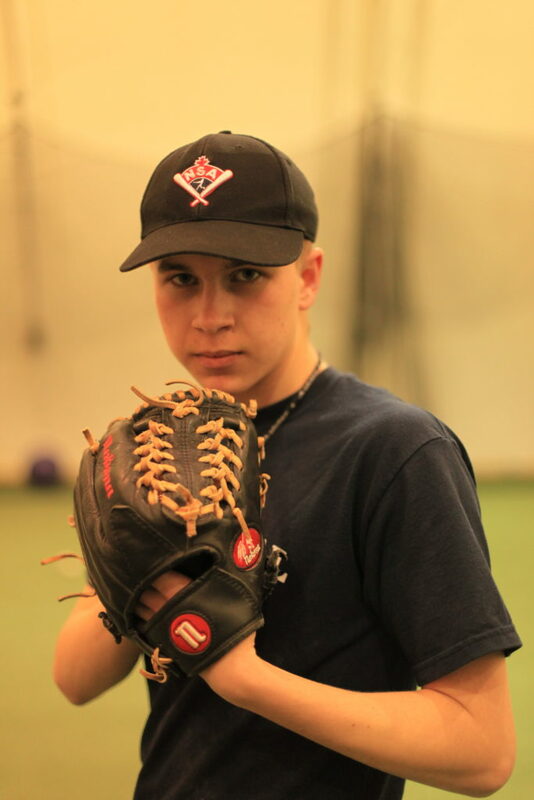 National Sport Academy Baseball is a unique and specialized training and learning environment at Central Memorial High School for student athletes in grade 10, 11 and 12. The goal is to experience and develop the lifestyle of a student athlete including high level baseball skills and tactics to play at the college / university level and higher. Periodized sport training is designed to work in harmony with the demands of student athletes’ training schedules and academic course load. Achieving a student athlete’s dream of becoming a high performance student athlete, receiving an athletic scholarship, playing college / university athletics, making a career playing or working in the baseball industry or playing for your country are all lofty goals. Training for this lifestyle is essential. National Sport Academy Baseball student athletes can achieve what many National Sport Academy alumni have achieved – playing and competing at an elite level in their sport. National Sport Academy Baseball student athletes can increase their batting practice swings by as much as 6000 swings per year more than a player not in the National Sport Academy. National Sport Academy Baseball student athletes have the ability to develop multi-sport athleticism because they are not training for baseball each evening and through the weekend. It also provides better life balance and the opportunity to develop other areas of their life or have a part-time job. Training during the school day creates more time outside of school to take care of academics. National Sport Academy Baseball develops better baseball players, but our teaching curriculum is centered around developing outstanding young men. Training intertwined with high school provides many avenues to develop student-athletes on a personal level. 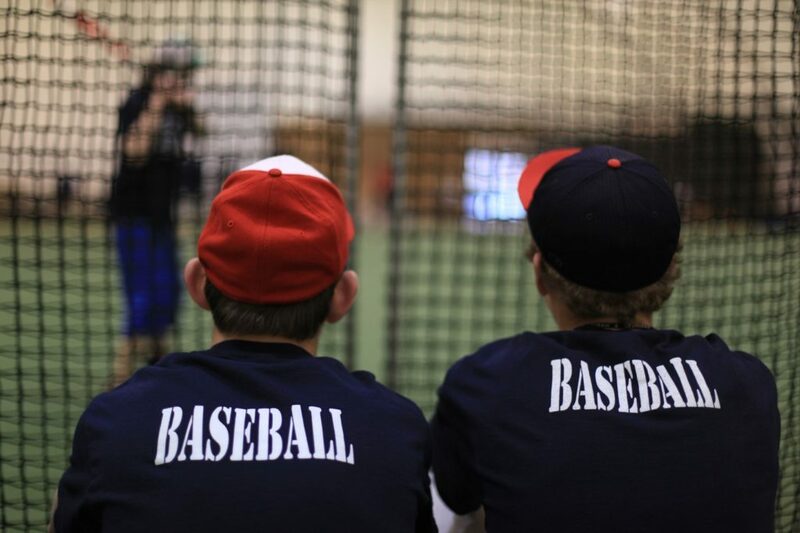 When comparing one aspect of baseball – batting practice, a student athlete playing baseball and participating in National Sport Academy Baseball when compared to someone training / competing with only his / her club team, can receive approximately 5000 – 6000 more swings in batting practice annually than someone who does not have the advantage of the National Sport Academy. Routes Choices & Scholarships in Baseball – college placement, eligibility, resumes. 4 sessions per week during a typical week. National Sport Academy Baseball player throwing program. Outdoor training, on the field – September to Thanksgiving & April 15th until the end of classes in June – weather permitting. 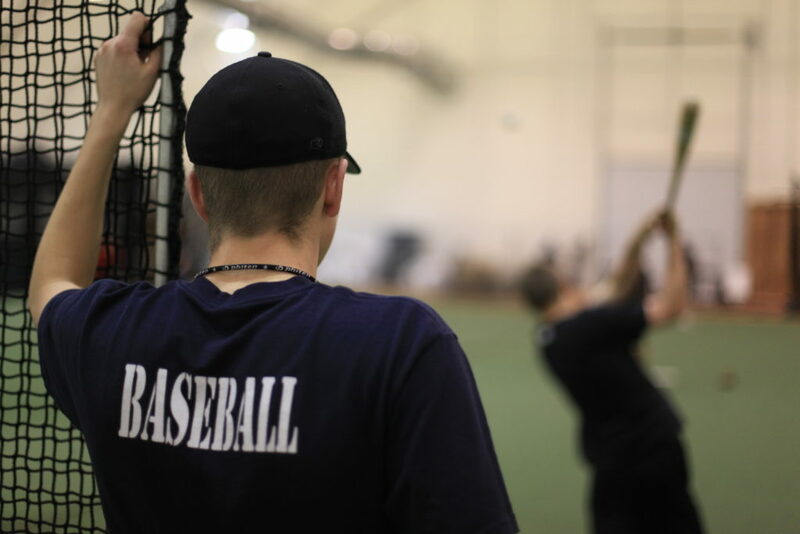 National Sport Academy Baseball skill development sessions will include position specific instruction, team defensive systems, as well as slow motion analysis of pitching, hitting, and defensive techniques. Teaching will take place mostly in small group sessions and will be held both outdoors in the fall and spring and indoors during the winter months. Indoor training gives National Sport Academy Baseball players the opportunity to make significant adjustments to their mechanics and see exponential improvements when combined with quality repetitions and work in the weight room. 3 to 4 sessions per week. National Sport Academy Baseball’s strength and conditioning component is what sets us apart from any other baseball program in this area. Our head strength coach, Thomas Scarr, is a former college player with a Kinesiology degree from the University of Calgary. Thomas has in depth knowledge of baseball skills and mechanics and how to improve those skills and mechanics through speed and agility training and specific strength training. Strength and conditioning sessions are baseball specific in design and will be scheduled to coincide optimally with each player’s competition schedule. 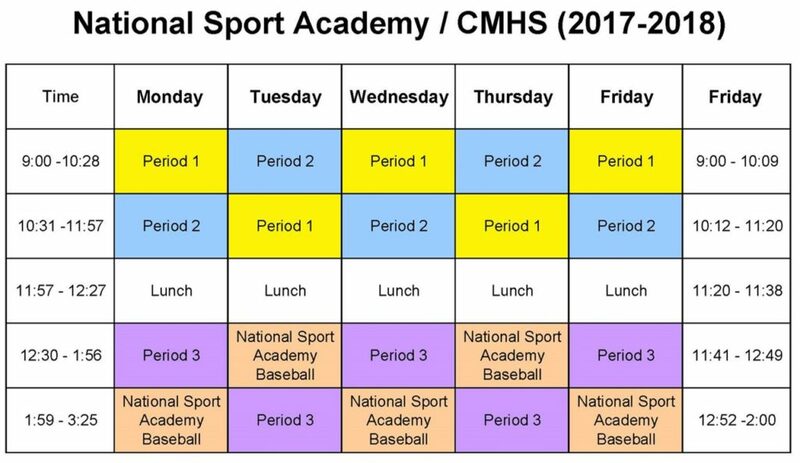 National Sport Academy Baseball trains every school day in period 4 of the Central Memorial High School timetable. National Sport Academy Baseball student athlete’s training consists of just under 400 hours of purposeful training – 10 hours per week over 39 weeks from September to June. Access to an additional 63 hours of optional training to enhance skill development. Students-athletes complete most of their National Sport Academy Baseball training during their regular class time so there is no conflict with commitments outside of regular school hours. Transportation is provided to and from training sessions when training occurs during the school day. Approximately 30 games during the fall and spring (dependent on registration). National Sport Academy student athletes are like minded with dreams of playing baseball at the college / university level and ultimately the pros. Students who attend NSA from grade 10-12 will also earn their LEAD certificate which is a leadership program designed specifically for youth and accredited by the City of Calgary. Student athletes have the opportunity to receive at least 15 credits by using the National Sport Academy training as well as their club training to achieve the learning outcomes for Phys Ed 10, 20 & 30. Additional credits may be earned in Career & Technology Studies courses such as nutrition or sports psychology. A coaching staff with professional and college experience. Performance testing to measure progress. Top quality indoor and outdoor facilities. National Sport Academy Baseball players are free to participate with the program of their choice outside of the school hours. Registration is on-going throughout the year.